I am the sort of customer that supermarkets hate – I am loyal to none and I like to pick and choose where I shop, when I shop and how much I buy each time. One thing you can't get away from now is since the introduction of the carrier bag charge last October taking your bags each time is a must. Over the years I have amassed quite a collection of cotton and jute bags – in fact I find it hard to resist buying another one whenever I see one. 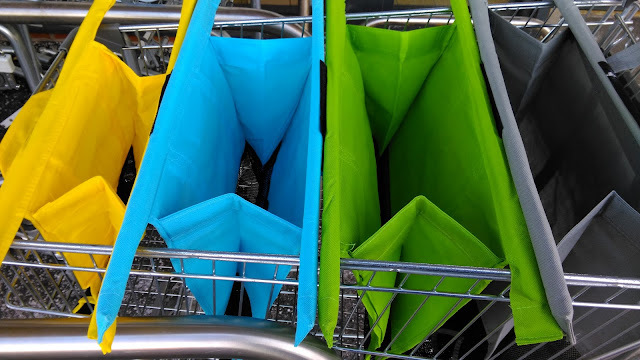 The cotton bags are handy for folding up in my handbag for when I buy a few items but they are a bit of a pain when doing a big shop. One of the problems is they don't stand up or stay open by themselves; this is where Trolley Bags come in. 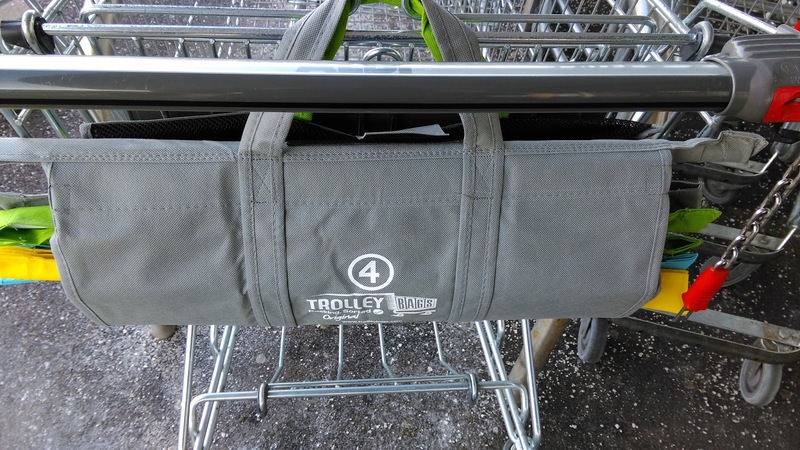 Trolley Bags are designed to fit inside your trolley so when you get to the checkout you simply spread them out and put your shopping straight in. A set of the bags come in four different sizes and are held together by velcro strips. I was bit worried they wouldn't fit on the end of the trolley as I was doing my shopping but I was quite wrong. The four bags are to carry designed to carry a number of different sized items. The biggest one is very deep and perfect for loo rolls and large multipacks of crisps. Don't pack the large one with too many heavy items otherwise you won't be able to lift it out of the trolley. 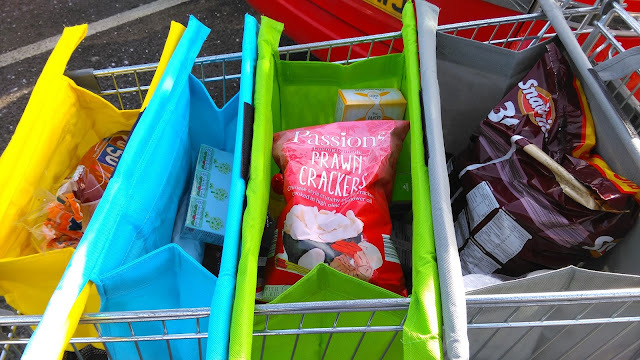 Where these bags really do come into their own is when shopping at the budget supermarkets when at the checkout you have to throw everything into your trolley in a blink of an eye. I have to admit it seemed quite strange to be able to walk straight out of the store after paying instead of having to jostle to find a space to pack all my shopping up. As I walked out I noticed a few admiring glances and complimentary comments about my Trolley Bags. If you're worried about them getting dirty there's a hole at the end of the rail so you can take the rail out and then wash them. What I would suggest is the introduction of an insulated bag. I don't buy a lot of frozen food but in the summer the odd tub of ice cream does fall into our trolley and it would be nice to know that it wasn't going to turn into milkshake by the time I arrived home. All in all though a great invention and one which will make supermarket trips a little less stressful and a bit quicker. *Update* - I've just heard back from Trolley Bags and they plan to introduce an insulated bag shortly. Hurrah! I was sent a set of Trolley Bags for review purposes. All words, photos and opinions are my own. 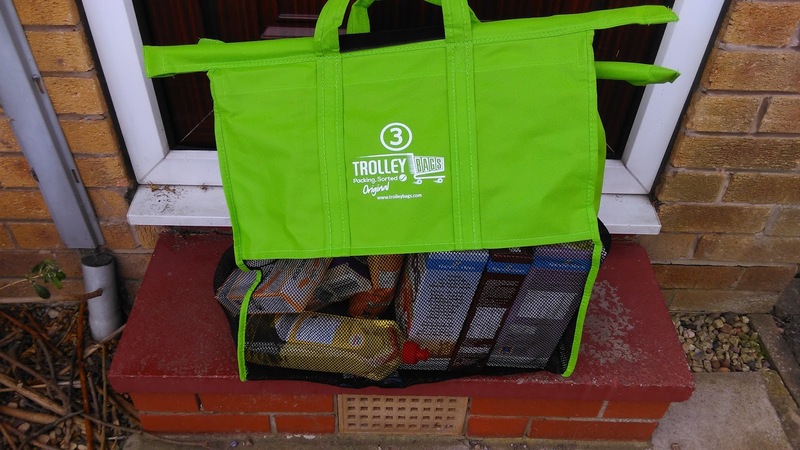 I've seen a couple of posts about trolley bags, and they all look fab! I think I'll have to get some, I'm fed up of fighting to keep my bags open! I've seen these around. Would love to try them out. I love the way they organise your shopping!